If the humerus (upper arm bone) has a tendency to come out of its normal position in the shoulder joint due to a deficiency in stabilizing forces, orthopedic surgeons refer to this condition as shoulder instability. At Meier Orthopedic Sports and Regenerative Medicine, our surgeons specialize in arthroscopic shoulder instability repair. Shoulder instability occurs when the head of the humerus (upper arm bone) comes out of the ball and socket joint. This can be caused either by sudden injury, or overuse. Since the shoulder is the most freely mobile joint in the body, this capability of motion means that the shoulder is anatomically less stable than other joints. Once the shoulder has ever been dislocated, and the ligaments, tendons, and muscles have become loose or torn, the joint becomes predisposed to recurrent subluxation or dislocation. Subluxation happens when the humerus becomes dislodged or dislocated but then returns to its original position on its own. Dislocation, on the other hand, means that the humerus comes out of its socket and stays dislodged, typically until a doctor or other medical professional helps to put it back in its normal place. Chronic shoulder instability is the condition of having a persistent inability of the surrounding muscles and tendons of the joint to keep the arm firmly in its proper place within its socket. Most often, this condition results from a traumatic injury or previous injury to the shoulder whereby the joint slipped out of its normal position. To learn more about potential treatment options through arthroscopic surgery, visit medlineplus.gov or contact the team at Meier Orthopedic Sports and Regenerative Medicine by calling 310.736.2793 or filling out the online contact form for orthopedic services and sports medicine. Activity modification is essential a series of lifestyle changes designed to avoid activities that exacerbate the symptoms of upper arm joint instability. Non-steroid anti-inflammatory medications both help with pain and reduce swelling and inflammation. These drugs include over-the-counter options like ibuprofen or naproxen. A comprehensive physical therapy program will include exercises designed to strengthen shoulder muscles and work on improving upper arm control. An orthopedic surgeon or physical therapist can design a home exercise program aimed at increasing stability in your upper arm joint. Regenerative medicine treatments trigger and boost the body’s natural healing processes to ensure a faster recovery and better results. Each technique harnesses specific growth factors, such as platelet-rich plasma or stem cells, which are collected from the patient and then injected into the damaged joints and tissues to achieve optimal healing in less time without surgery or in addition to surgical treatments. If the nonsurgical treatment options have proved insufficient in treating symptoms, an orthopedic surgeon might recommend surgery to repair shoulder instability. In the past, open surgery was the only option for patients with shoulder instability. A single, large incision was needed in order to access the structures to repair the ball and socket joint. Today, our orthopedic surgeons utilize the latest in arthroscopic techniques to perform shoulder instability repair. Arthroscopic shoulder procedures require just a few small incisions and typically leads to fewer complications, less scarring, and a quicker recovery time. Patients will also partake in a post-operative rehabilitation program designed to help the shoulder heal strongly. The shoulder may be kept secured in a sling for a few weeks after surgery. 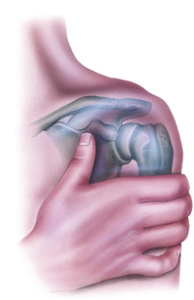 Once the sling is removed, exercises designed to restore range of motion and strength in the upper arm joint are begun. More difficult strengthening exercises will be added gradually as rehabilitation progresses. The important thing to remember is to follow the doctor’s treatment plan. Physical therapy is often the most important part of returning to full health and function after shoulder instability surgery. Soft tissues in the shoulder can be repaired using tiny instruments and small incisions through arthroscopy or arthroscopic surgery. Shoulder arthroscopy is a same-day or outpatient procedure where a surgeon looks inside the joint with a tiny camera and performs surgery with special pencil-thin instruments. The key instrument in arthroscopic surgery is the arthroscope, a small fiber-optic device that allows our orthopedic surgeons to see inside of a joint without making any large incisions. An arthroscope has a camera lens and a light that connects to a video camera that connects to a video monitor in the operating room. This gives the surgeon a clear view of the tissue inside the joint. Arthroscopic surgery requires just two or three small incisions, each about six millimeters wide, to insert the arthroscope and other tiny instruments, each just three to four millimeters in diameter. Our orthopedic surgeons can repair the shoulder joint using these tiny instruments while looking at the video monitor in the room. Whether working with recreational athletes, injured workers or any other individuals, Dr. Meier provides each patient with the quality of care given to professional athletes. His team utilizes multiple therapeutic techniques, which may include an exercise program, rehabilitation and/or minimally invasive surgery. When surgery is necessary, the most current and innovative technologies are employed to result in less post-operative pain and a faster recovery. Contact our Beverly Hills office today at 310.736.2793 to find out why Dr. Meier is known as a leading surgeon within his specialty.